Any sport that can be enjoyed in your garden classifies as a garden sport. Your children may love playing Frisbee or want to try their hand at a round of croquet or several innings of baseball. Let them guide you, and try to have as many different activities on hand as possible to stop them from getting bored. Garden recreation is a beautiful thing: it allows children to enjoy the fresh air in the safety of their own home environment while developing both their physical and mental skills. Some sports may require a small investment from you, but if their interest develops into a lifelong passion, it will be worth it! Frisbee. It doesn't have to only involve just chucking a plastic disk around. Frisbee enthusiasts have developed loads of challenging games and tricks, from Ultimate Frisbee to Frisbee Golf. Horseshoe. Buy a set and entice your children to develop their throwing prowess. 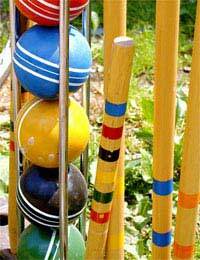 Croquet Set. Can be fun for adults as well as children, and will look very impressive when you have your next garden party! Cricket. Reward your children after a three-day game with cucumber sandwiches and iced tea. Football. Whether you just kick a football around or play a real game, your boys – and hopefully your girls as well – will enjoy taking part. Skipping Rope. Younger children will love skipping, and you will love having them skip outside rather than in the living room or kitchen. Basketball. Simple wall-mounting hoop sets can be bought from a variety of places, or you can buy a more permanent and sturdy basketball hoop from a sporting goods store. Softball. Bring out the American in your children with the fun and easy-to-understand game. All you need to buy is a bat and a ball. Good for ages five on up. Table Tennis. All-weather tables are available, making this a perfect investment for your children. And you'll never have to lug it inside! Bowls. Not just for old men, bowls is a game of both skill and luck. Smaller children who are too young to take part in garden sports may enjoy a variety of outdoor toys suitable for their age and interests. Older children will also love some of the outdoor play equipment designed for the more mature set. Climbing frames. Buy a multi-activity frames which will suit your children's ages as well as the available space in your garden. Trampoline. Play it safe and only purchase one with a safety netting, especially with younger kids. Swings and slides. As simple or as complex as you want them to be. Sand and water toys. Whether you want a built-in sandpit or a simple water tray, these are great for small children. Playhouses. Your kids will get hours of delight with a simple Wendy house. Treehouses. If you have a big tree, go for it. Tree toys, such as rope ladders and monkey swing seats, can add to the fun. It's vital that children get a big dose of fresh air on a daily basis, and there's no better place than your own garden. Encourage them to make the most of being outside with a fun and enticing selection of toys and games. Playing in the garden is part of what being a kid is all about, and summer just isn't summer unless they get dusty, dirty and tired!